Governor Tom Wolf presents Kennett Township staff with the 2017 Local Government Excellence in Building Community Partnerships award, in recognition of the creation of Barkingfield Park. Courtesy: Kennett Township. KENNETT – The room was packed during Wednesday’s Board of Supervisors meeting as dozens of citizens came out to seek the board’s support of a resolution that is part of the growing effort to stop gerrymandering in Pennsylvania. The resolution, which calls for an independent citizens’ commission for legislative and congressional redistricting, will be sent to all local and state representatives. Resident Greg McCoy presented the board with a petition signed by 226 residents who support it. The board acknowledged the problems created by gerrymandering practices. “I believe that it hurts democracy when you don’t have any idea of how or why you have a legislative person representing you,” Supervisor Richard Leff added. The board voted unanimously to support the resolution. 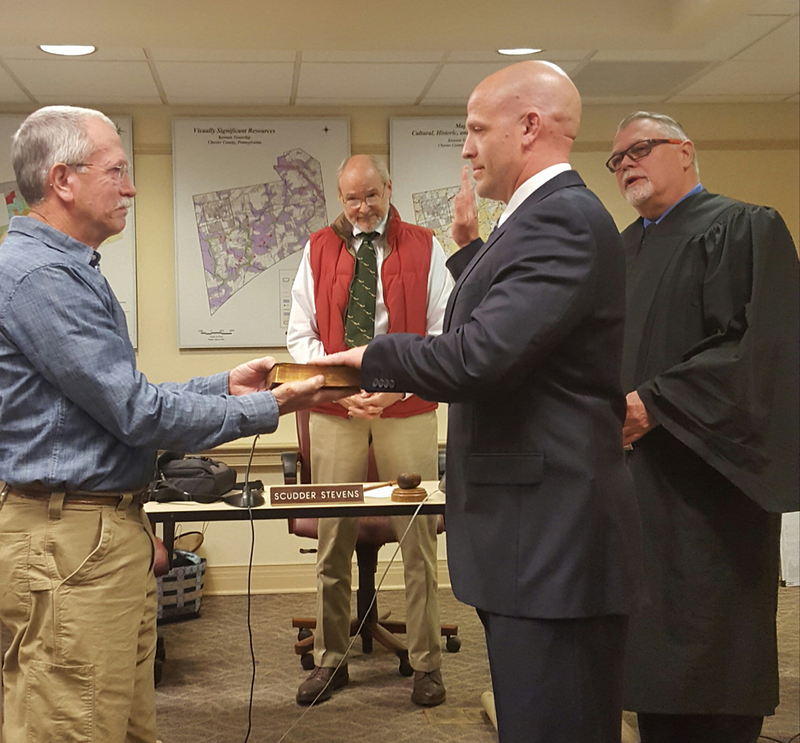 Kennett Board of Supervisors Chairman Scudder Stevens looks on as Adam Cramer is sworn in as an officer of the Kennett Township police department by retired judge Daniel Maisano. On a celebratory note, the township police department welcomed two new officers to their ranks. 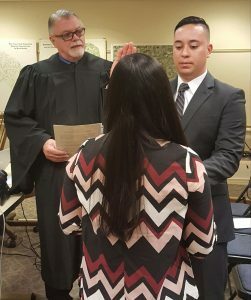 Adam Cramer and Miguel Juarez were sworn in by Retired Magisterial District Judge Daniel Maisano. They replace two officers who had left the department. Cramer is a veteran officer with 14 years of experience, and he comes from Lancaster County. “When we have the option to have a police officer with that tremendous amount of experience, I say it’s almost like getting a superstar on your police force without spending all the time in spring training,” Chief of Police Lydell Nolt said of Cramer. “We got a good free agent,” Vice-Chair Whitney Hoffman added. Miguel Juarez is sworn in as an officer of the Kennett Township police department by retired judge Daniel Maisano. 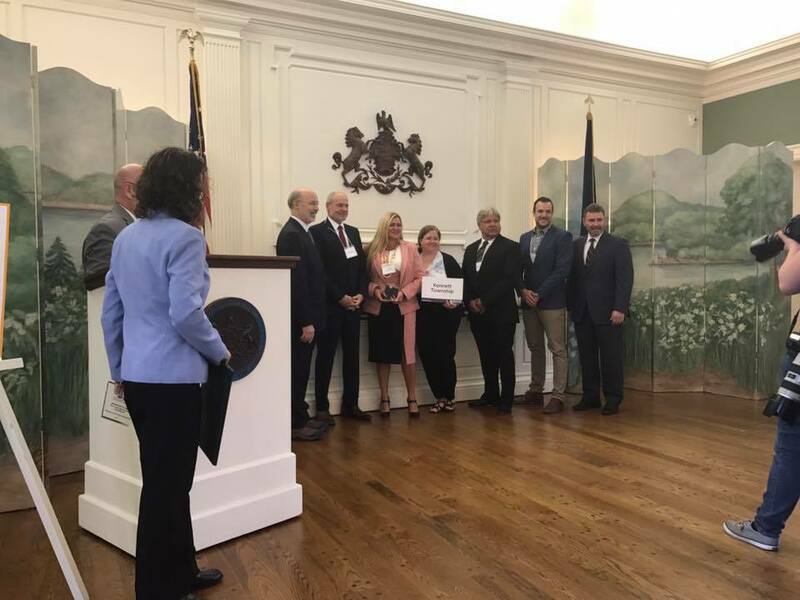 Chairman Scudder Stevens announced that the board recently accepted the Governor’s Award for Local Government Excellence in Building Community Partnerships from Governor Tom Wolf during a ceremony in Harrisburg. The award was given to the township in recognition of the Barkingfield Park project, and he noted that they also received resolutions from the Pennsylvania Senate and the House of Representatives for the project. “The interesting thing about it is how Barkingfield Park came about, because it was a merger of business interests and township effort,” Stevens said. “It was a mixture of a whole bunch of different things that came together to allow our very first park, that we own, to come into fruition, but done in a most unique, creative, and exciting way.” He also thanked Township Manager Lisa Moore for being a “guiding light” in helping make the project possible. Moore gave her report regarding several ongoing projects. The township and the borough of Kennett Square just received a grant that will cover 70% of the cost to amend zoning, based on the findings of the recently completed joint economic development study. Construction on the sidewalk project connecting the township to the borough, which has been two and a half years in the making, will begin in June and is expected to take 60 days to complete. The township has also received funding to resurface some of the existing trails in the township, including the Parrish trail, the Pennock Park trail, and the Whittle trail. They also received a $1.2 million grant to run a trail down Chandler Mill Road, from Hillendale Road down to Chandler Mill Bridge. Moore reported that the township is beginning to work with the borough to develop an active transportation plan, which will help improve bicycle and pedestrian access in both areas. The study to develop the plan will be conducted in the fall of 2017, and then grant applications will be submitted to cover the cost of implementing the plan. 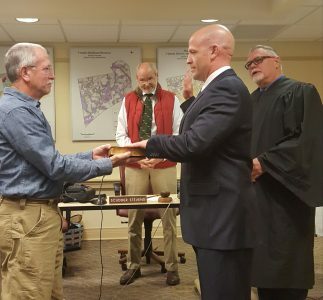 During his police report, Nolt publicly acknowledged the contributions of Officer Rick Bell, who recently left the township department to accept a chief of police position in Frackville Borough, Schuylkill County. He reported that there were 433 police incidents in the township during March 2017, and the state police in Avondale assisted with 45 of those incidents. He also noted that 39 citations have been issued so far as part of the aggressive driving grant focused detail that started on March 20 and will end on April 30. Nolt thanked the Exelon Corporation for recently providing trauma kit packs for each officer in the police department, and for their funding to set up a CrimeWatch program in the township. CrimeWatch is an online service and mobile application that will send residents instantaneous crime alerts and safety tips if they register for it. “It allows you to see exactly what your police department is doing,” Nolt said. Kennett Library Board of Trustees members Jeff Yetter and Bill McLachlan provided an update on the library’s activities during the past year, including their work towards building a new library on the corner of State and South Willow Streets in Kennett Square. Yetter said that a public meeting will be held on Tuesday, April 25, at 7:30 p.m. at the atrium of the Genesis Building, located at 101 East State Street. During that time, people can view and comment on preliminary design plans for the new library. Yetter said that the library currently runs at a small deficit, which is covered by their endowment. He added that the initial fundraising estimate for the new building is $7 million. “You guys have done an amazing job turning the library around and making this happen for a new building,” Moore said to Yetter. He replied that the credit goes to the new board members for working well together. Immediately before the meeting, the board had held an executive session to discuss the possible acquisition of two parcels of real estate totaling approximately 6.2 acres for open space purposes. “Both properties are adjacent to a very large amount of open space in the township, so it’s an important connection,” Moore said. The board then continued the purchase discussion during the meeting and voted two to one in favor of buying the parcels, the location of which will be disclosed after the purchase is complete.